AleaSoft, October 2, 2018. 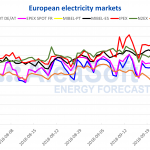 The month of September concluded as the second most expensive September in history, not only in the Iberian MIBEL market in Spain and Portugal, but also in other important European energy markets, as France and Germany, because the current situation of high prices in the energy markets is common throughout Europe. In the Iberian electricity market MIBEL of Spain and Portugal, the third quarter of 2018 had an increase in price in each month with respect to the previous month, and also with respect to the same month of the year 2017. The month of July had an average price of 61.88 €/MWh, which represented a difference of 13.25 €/MWh compared to the same month of 2017. In August the price rose to 64.33 €/MWh, and also increased the difference with the previous year, 16.57 €/MWh. The price increase accelerated in September that registered an average price of 71.21 €/MWh, which, apart from being the second most expensive month of the decade and the fifth most expensive month in the history of the MIBEL market, represented 22.12 €/MWh more than September 2017. Source: Prepared by AleaSoft using data from OMIE. An interesting feature of this third quarter is the flattening of the hourly price curve and the increase in the number of “no-valley” days. The decrease in the distance between the price of the valley hours and the peak hours is a common phenomenon during the summer season, due to the increase in demand and the low production from renewable sources that push up the lowest hourly prices. But during this month of July, the flattening of the price curve was especially significant, while in July 2017 the hourly spread of the price was 9.5%, in July of this year it fell down to 6.6%. Comparing the third quarter with what we have seen year to date and with the previous year 2017, there is a clear upward trend in the electricity market price. The first quarter of 2018 started 7.47 €/MWh lower than the same quarter of 2017, but we must remember the exceptionality of the first quarter of last year with the cold snap and the situation of the French nuclear plants that had half of the reactors shutdown at some point. The second quarter of this year registered an increase of 5.04 €/MWh in the year-on-year comparison. And in this third quarter, the difference with the third quarter of 2017 soared to 17.36 €/MWh, and set itself as the most expensive quarter of the last decade and the third most expensive in the history of the MIBEL market. 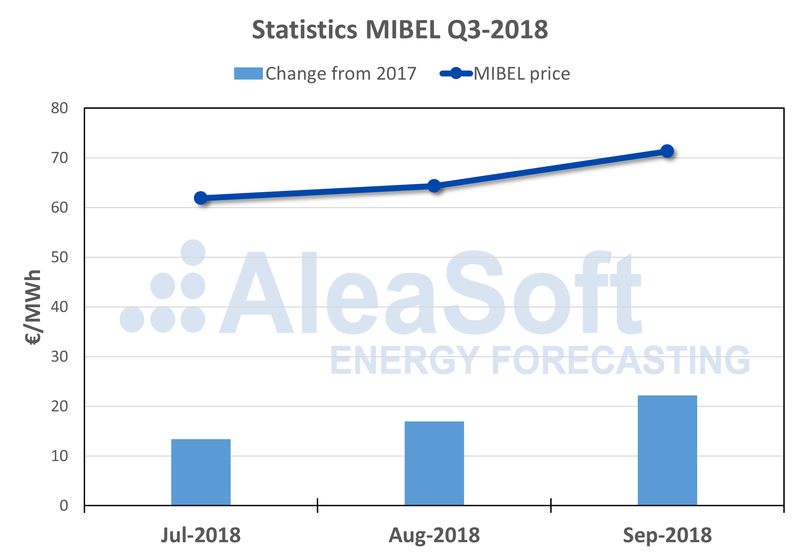 The average price of the MIBEL market from January 1 to September 30, 2018 is 55.38 €/MWh, which makes it, for the time being, the second most expensive year in the history of MIBEL, just behind year 2008. 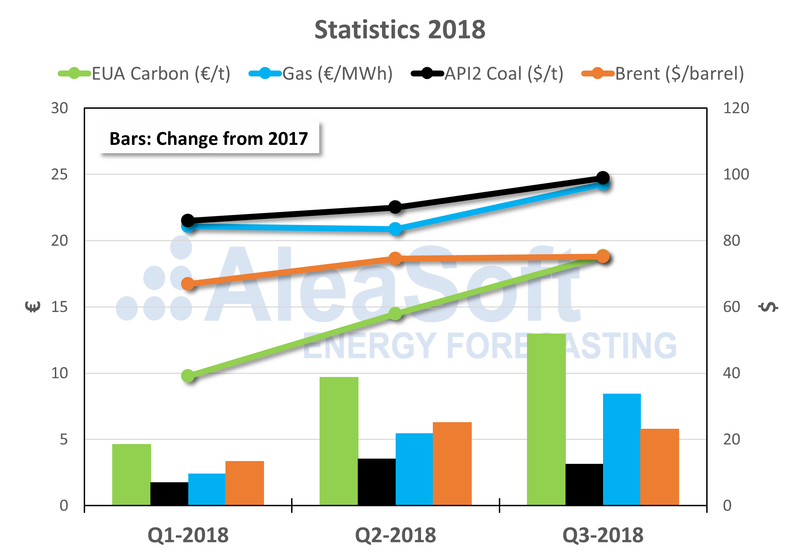 According to the data analyzed by AleaSoft, the main causes of the price increase during this year must be sought in the price increases of fossil fuels used for the generation of electricity, gas and coal, and the increase in the price of carbon emission rights. The thermal generation of electricity with gas and coal are the technologies that set the marginal price in most hours in the European electricity markets. The fact that the price of these two fuels has been rising during this year increased the costs of thermal production, which has been more expensive in the electricity markets. The price of a ton of coal has increased by 25% since the second quarter and is now above $100. The price of gas, on the other hand, has increased by 40% since the beginning of the year. Carbon emission rights are also a variable cost to add to thermal production, which makes the bids of these technologies more expensive in the electricity market. The price of the emission rights is in a bull run since mid-2017, and since the beginning of 2018 it has increased by more than 170%. Although many thermal power plants already have current emissions covered with previously purchased rights, the uncertainty created by the price increase has an upward effect on their bids. Also the price of a barrel of Brent oil has increased by about 25% since the beginning of the year and exceeded $80 at the end of September. Source: Prepared by AleaSoft using data from EIA, EEX and PEGAS. 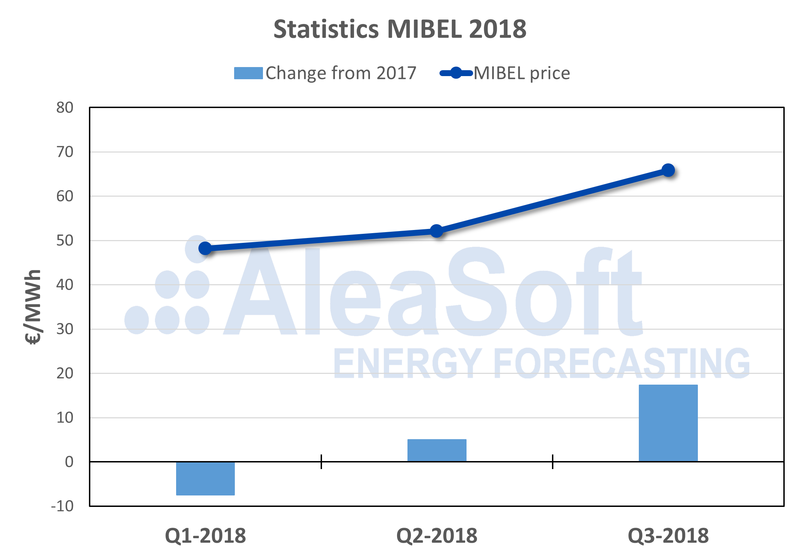 Although the increase in the price of gas and coal, and the carbon emission rights are the main responsible for the price increase in all European markets, AleaSoft considers that there are other factors to take into account when analyzing the price behavior of the MIBEL market. A key fact has been the situation of hydroelectric production. Generally, the production with dammed water has a cheapening effect on the price of electricity, due to the need of the dams to drain water to maintain the flow of the rivers and the levels of reserves with the contributions of the basins. But in recent months, since October of last year, the reservoirs of the Iberian Peninsula have been in a situation where their reserves were at minimum due to the long period of drought suffered until then. For this reason, the power plants have had full capacity to absorb the new water contributions and be able to carry out a strategy to maximize their revenues by offering their production at more expensive prices than usual. That deactivated its cheapening effect on the price of electricity. On the other hand, according to the AleaSoft analysis, wind energy production during the first three quarters of 2018 was below normal. With respect to the same period of 2017, wind production in the third quarter of 2018 was 16% lower. For the last quarter of 2018, according to AleaSoft forecasts, everything suggests that price will remain high, but with a tendency to stabilize, and that 2018 will end up being the most expensive year of the last decade and the second most expensive in history. 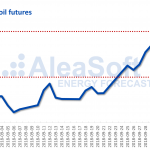 According to AleaSoft, this stabilization of the price is given by the stabilization of the price of gas and coal that could continue to rise, but at a much lower rate. The price of carbon emission rights does show a clear tendency to continue rising, although it is estimated that they will also do so at a much slower pace. The price of a barrel of Brent oil, once the barrier of $80 is exceeded, it seems that the next barrier is at $100, but most estimates suggest that the price will stabilize below it, and if it is exceeded, it would be for very short periods of time. We will also have to pay attention to how the new hydrological year begins, which will define the strategy of hydroelectric plants in the market. At the beginning of this hydrological cycle, reserves in hydroelectric reservoirs are 68% above the levels of October 2017.